LOCTITE SF 770 - Surface Preparation - Polyolefin Primer. LOCTITE SF 770 is a primer used to make polyolefin and other low-energy surfaces suitable for bonding with Loctite instant adhesives. The cured performance of LOCTITE instant adhesives is ensured on such treated surfaces. It is only recommended for difficult-to-bond substrates which include polyethylene, polypropylene, polytetrafluoroethylene (PTFE) and thermoplastic rubber materials. 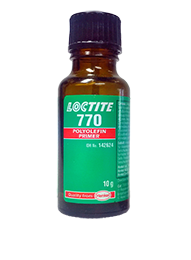 LOCTITE SF 770 is not recommended in assemblies where high peel strength is required.